The Global Volcanism Program has no activity reports for Iztaccíhuatl. The Global Volcanism Program has no Weekly Reports available for Iztaccíhuatl. The Global Volcanism Program has no Bulletin Reports available for Iztaccíhuatl. Iztaccíhuatl, the "Woman in White," presents the profile of a sleeping woman as seen from the Valley of Mexico. A series of overlapping cones constructed along a NNW-SSE line to the south of the Pleistocene Llano Grande caldera forms the summit ridge of the massive 450 km3 volcano. 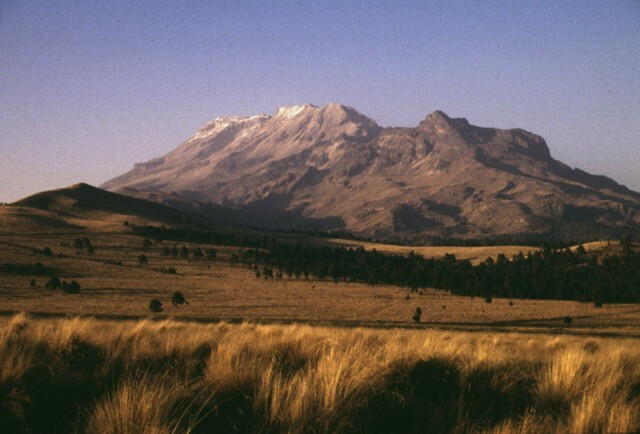 Andesitic and dacitic Pleistocene and Recent volcanism has taken place from vents at or near the summit of Volcán Iztaccíhuatl. Valley headwalls near the summit vent (El Pecho) are draped with flows and tuff beds post-dating an 11,000 years before present glaciation. The youngest vents are located at the summit and a depression at 5100 m along the summit ridge midway between El Pecho and Los Pies (White 1986). 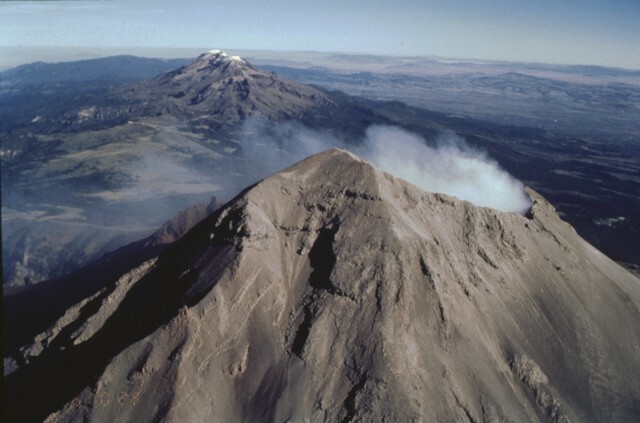 Nixon (1989) considered all summit lavas to be Pleistocene in age, but noted a postglacial dacitic vent on the south flank of Iztaccíhuatl, north of the saddle between it and Popocatépetl. This volcano is located within the Las Volcanes, a UNESCO Biosphere Reserve property. Cadoux A, Missenard Y, Martinez-Serrano R G, Guillou H , 2011. Trenchward Plio-Quaternary volcanism migration in the Trans-Mexican Volcanic Belt: the case of the Sierra Nevada range. Geol Mag, 148: 492-506. Nixon G T, 1989. The geology of Iztaccihuatl volcano and adjacent areas of the Sierra Nevada and Valley of Mexico. Geol Soc Amer Spec Pap, 219: 1-58. White S E, 1986. Iztaccihuatl, Mexico. Volcano News, 23: 1-3. The Global Volcanism Program is not aware of any Holocene eruptions from Iztaccíhuatl. If this volcano has had large eruptions (VEI >= 4) prior to 10,000 years ago, information might be found on the Iztaccíhuatl page in the LaMEVE (Large Magnitude Explosive Volcanic Eruptions) database, a part of the Volcano Global Risk Identification and Analysis Project (VOGRIPA). There is no Deformation History data available for Iztaccíhuatl. There is no Emissions History data available for Iztaccíhuatl. The elongated Iztaccíhuatl has a more conical profile when viewed from the south at the Querentano hut on Popocatépetl. Paso de Cortés, a 3680-m-high saddle, separates the two 5000-m-high peaks. One of the youngest vents of Iztaccíhuatl is a dacitic lava flow north of this saddle. The flow traveled 5 km to the east. Photo by Jim Luhr, 1981 (Smithsonian Institution). The symmetrical Popocatépetl volcano towers south of the elongated summit ridge of Iztaccíhuatl. 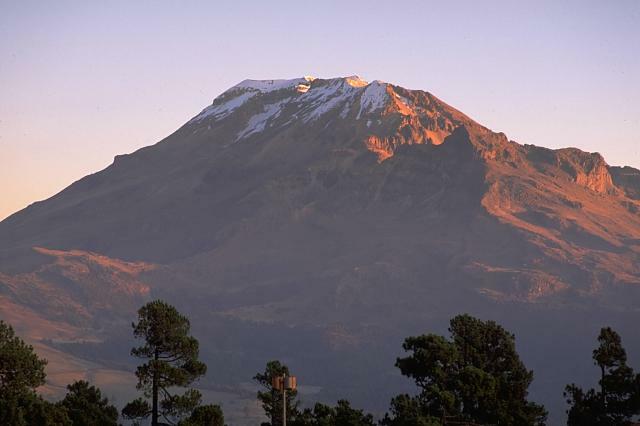 The two 5000-m-high volcanoes are popular climbing destinations from Mexico City, 60 km to the west. Unlike the eroded Iztaccíhuatl volcano, which has been infrequently active during the Holocene, the conical Popocatépetl has been vigorously active. 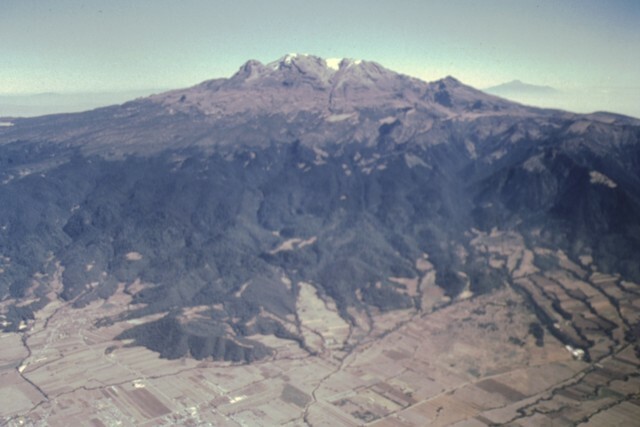 Viewed from east of the Paso de Cortés, south of Iztaccíhuatl, the volcano's summit appears at the far left at the northern end of the elongated summit ridge. The peak in the shadow below the right skyline is Los Pies, the southernmost of the major volcanic vents forming Iztaccíhuatl. A postglacial dacitic vent is located on the lower south flank of the volcano, north of the saddle between Iztaccíhuatl and Popocatépetl. Copyrighted photo by Stephen O'Meara, 1993. 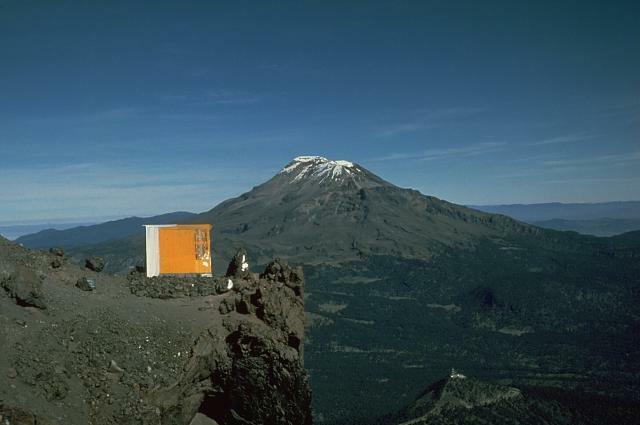 Iztaccíhuatl, the "Woman in White," presents the profile of a sleeping woman as seen here from the west above the Valley of Mexico. A series of overlapping cones constructed along a NNW-SSE line to the south of the Pleistocene Llano Grande caldera forms the summit ridge. From left to right they are La Cabeza (the head), El Pecho (the breast), Las Rodillas (the knees; at the end of the central summit ridge), and Los Pies (the feet). The volcano is mostly Pleistocene in age, but minor Holocene activity has occurred. Photo by Gerardo Carrasco-Núñez (Universidad Nacional Autónoma de México). Iztaccíhuatl, an elongated complex stratovolcano, rises SW of the Puebla basin in central México. A series of overlapping cones constructed along a NNW-SSE line forms the summit ridge, which is 6 km long at the 4500 m contour, a little above the snowline. Glaciation has extensively eroded the summit and flanks of the dominantly Pleistocene volcano. Iztaccíhuatl was climbed by Toltec Indians, who left terracotta, carved stone, jade, and obsidian artifacts just below the summit, forming the highest archeological site in North America. 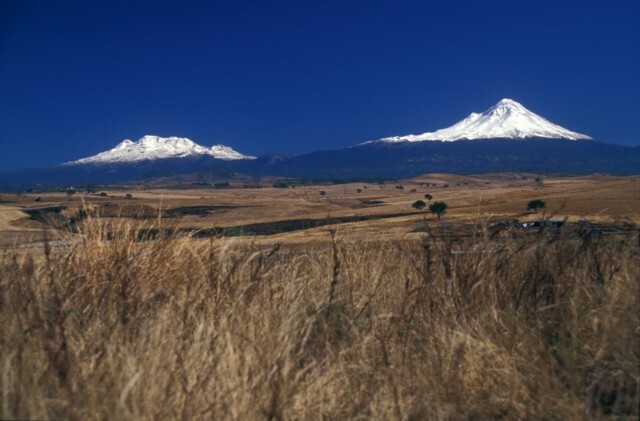 The twin volcanoes of Iztaccíhuatl (left) and Popocatépetl dominate the landscape east of the Valley of Mexico. The differing profiles of the two volcanoes, the 2nd and 3rd highest in México, reflect the varying styles and durations of volcanism. Iztaccíhuatl's elongated form reflects migration of volcanism over long periods of time along a NNW-SSE trend; it is largely Pleistocene in age, and has been extensively eroded. Symmetrical Popocatépetl is much younger and has more-localized vents. It has erupted frequently since the beginning of the Spanish era. The Sierra Nevada east of the Valley of Mexico is a N-S-trending volcanic chain that runs perpendicular to the E-W trend of the Mexican Volcanic Belt. 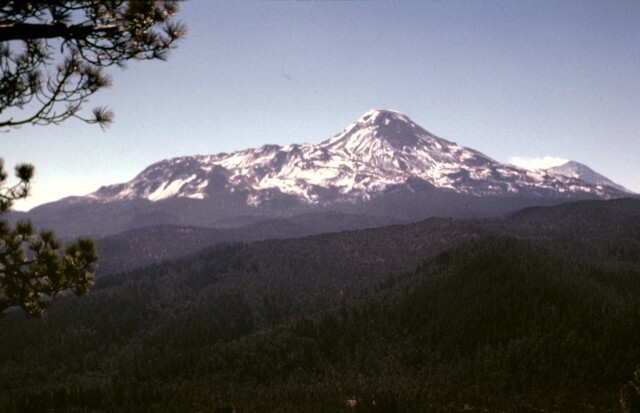 As with other transverse volcanic chains such as Cántaro-Colima and Cofre de Perote-Orizaba, the Sierra Nevada range is younger to the south. 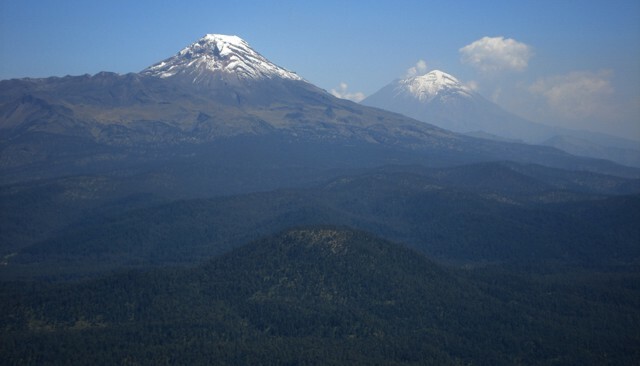 The broad forested volcanoes of Tláloc and Telapon in the distance are Pliocene in age, snow-capped Iztaccíhuatl in the center is largely Pleistocene, and steaming Popocatépetl in the foreground has been historically active. Iztaccíhuatl volcano rises more than 2500 m from the floor of the Valley of Mexico to form México's third highest volcano. The profile of a sleeping woman that gives the volcano its name can be seen in this aerial view from the west. The massive 450 cu km volcano is a composite of overlapping edifices that interfinger along a N-S-trending line. 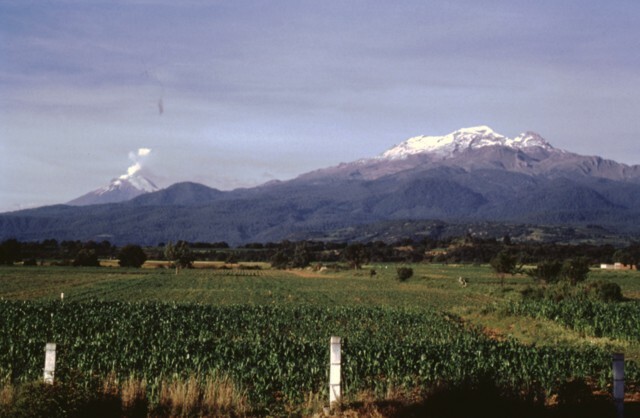 The snow-capped peaks of Iztaccíhuatl (right) and Popocatépetl (left) rise above farmlands at the eastern margin of the Puebla basin and are the centerpieces of Izta-Popocatépetl National Park. Andesitic and dacitic lava flows erupted from the N-S-trending chain of volcanoes forming the summit of Iztaccíhuatl extend all the way to the base of the volcano. 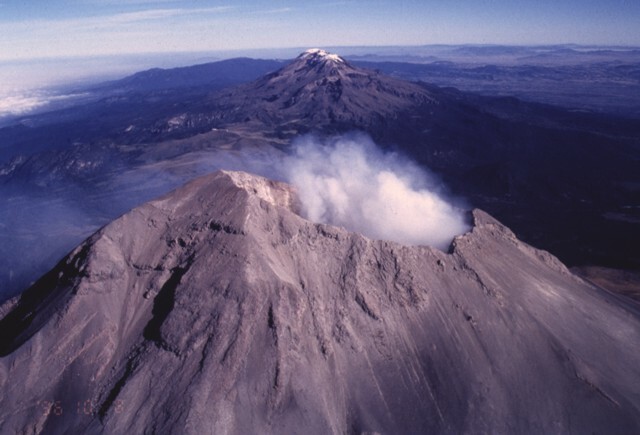 A steam plume rises from the summit of Popocatépetl in this 1996 photo. The Sierra Nevada SE of Mexico City is capped by two massive stratovolcanoes. Iztaccíhuatl, in the center of the N-S-trending range, is at the upper left, and steaming Popocatépetl is in the foreground at the southern extremity of the range. The Sierra Nevada separates the Valley of Mexico from the Puebla basin, which can be seen to the east. 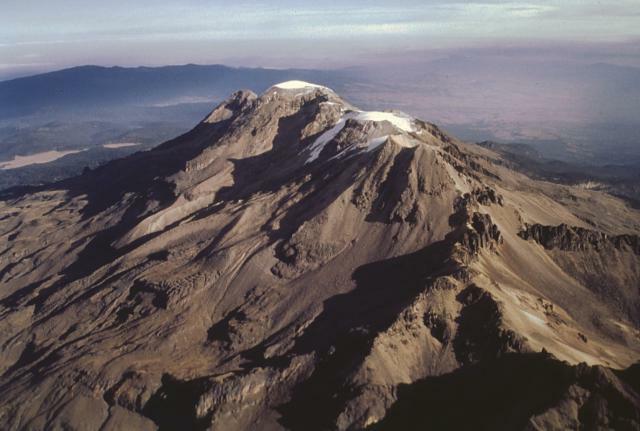 Ashfall from recent eruptions covers the summit snow cap of Popocatépetl in this 1996 photo. Iztaccíhuatl, a massive 450 cu km stratovolcano SE of Mexico City, is seen here from the SW. 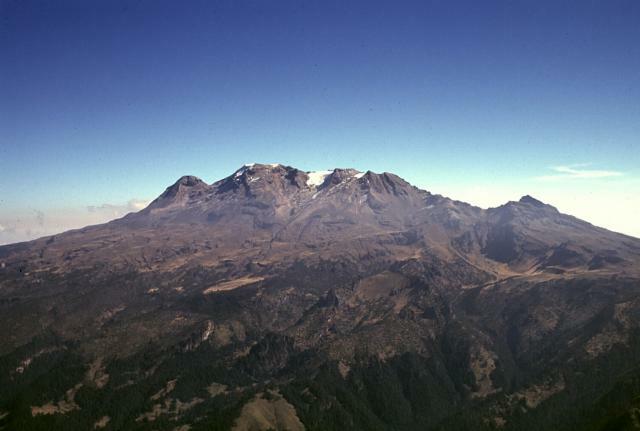 The summit of the compound volcano is composed of several overlapping volcanoes, including the northernmost peak, La Cabeza (left), the snow-capped high point El Pecho, and Las Rodillas (below the lower Ayoloco glacier at the right-center). Most activity ceased during the Pleistocene, and the volcano has been extensively glaciated, as seen by the sharp-crested glacial moraines at the left-center below the Ayoloco glacier. Iztaccíhuatl volcano presents a different profile from the north as seen from the summit of Papayo volcano. 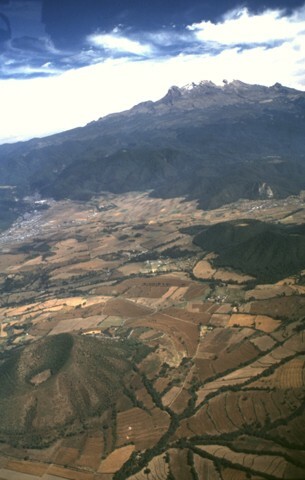 The northern base of the volcano is formed by the Llano Grande shield volcano (the oldest edifice of Iztaccíhuatl) and the NW-flank La Trampa lava flows. The low-angle ridge extending to the NE (left) consists of the Teyotl dacitic lava flows, erupted from a vent on the upper northern flank about 80,000 years ago. A steam plume pours from the summit of Popocatépetl volcano at the extreme right. The broad Iztaccíhuatl massif rises north of Paso de Cortes, the 3680-m-high saddle between Iztaccíhuatl and Popocatépetl volcanoes. The conquistador Cortés crossed the pass, from where he first saw Tenochtitlán, the Aztec capital. The summit of Iztaccíhuatl is at the left, NNW of the apparent high point Las Rodillas (center). The sharp peak at the right is Los Pies (also known as Amacuilecatl), the southernmost major peak of the volcano. The volcanoes bordering the Valley of Mexico are linked in mythological accounts to Aztec deities. 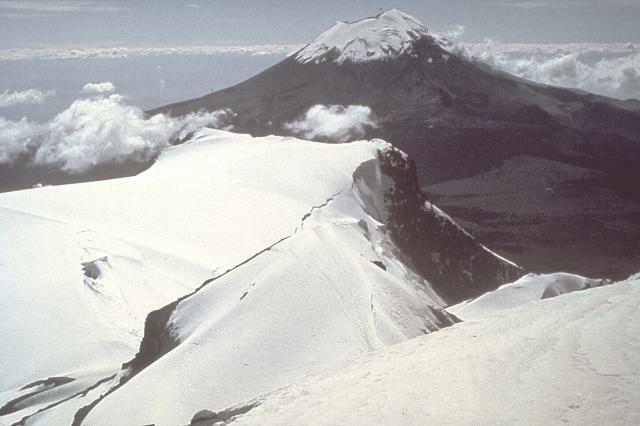 Popocatépetl (right), the "Smoking Mountain," is said to hold a funeral torch for princess Iztaccíhuatl (left), the sleeping "Woman in White," after she died of grief when falsely told by the enemies of Popocatépetl that he had been killed. The hills in the foreground (seen from the summit of Xitle cinder cone) are part of the broad Chichinautzin volcanic field south of Mexico City. Chichinautzin means "Burning Lord," a possible reference to eruptive activity. Monogenetic volcanic cones of the Chichinautzin volcanic field lie below the western flanks of Iztaccíhuatl volcano. These cones, including Cerro Tenayo at the lower left, lie at the easternmost extension of the 90-km-wide Chichinautzin volcanic field south of the Valley of Mexico. The compound Iztaccíhuatl volcano is mostly Pleistocene in age. 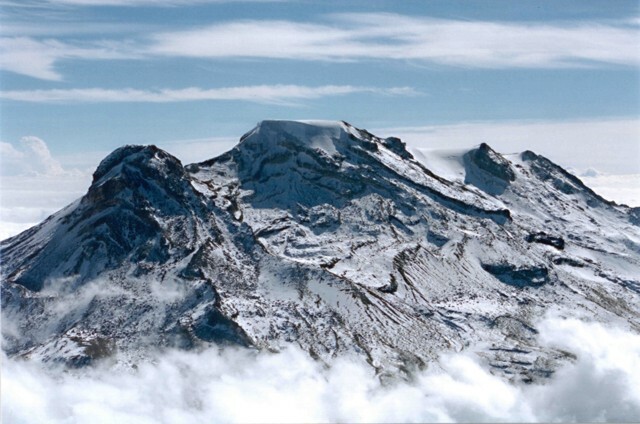 Iztaccíhuatl, the "Woman in White," rises above the clouds in this aerial view from the NW. The summit ridge is formed by a series of overlapping volcanoes. La Cabeza (the head) is at the left, glacier-covered El Pecho (the breast) in the center, and Las Rodillas (the knees) at the far right. The Las Rodillas complex was constructed by at least two vents. Photo by Hugo Delgado, 1996 (Universidad Nacional Autónoma de México). 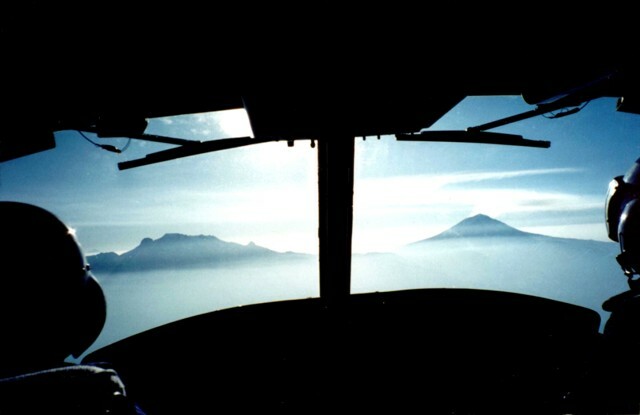 A Bell 412 helicopter climbs up at 5200 m heading east towards Popocatépetl (right) and Iztaccíhuatl (left) in March 2000 during a monitoring flight. Opposing winds above 6000 m give the volcanic plume from Popocatépetl an "S" shape. The Centro Nacional de Prevención de Desastres (CENAPRED), headquartered in Mexico City, is engaged in an active monitoring program on Popocatépetl using instrumentation to evaluate seismic, geodetic, and geochemical parameters of the ongoing eruption. Photo by Servando De la Cruz-Reyna, 2000 (Universidad Nacional Autónoma de México). 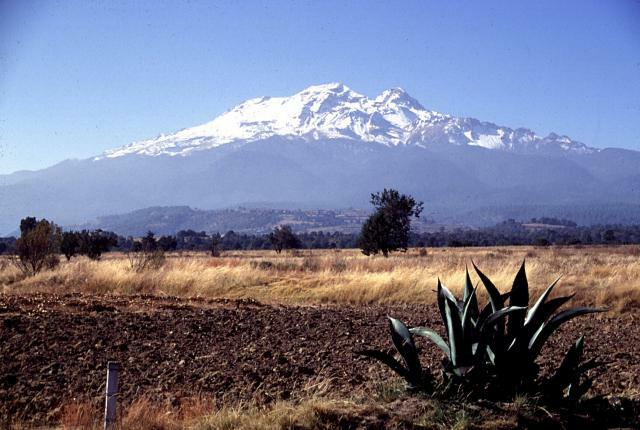 The N-S-trending Popocatépetl-Iztaccíhuatl volcanic chain lies between the Valley of Mexico and the Puebla basin. Snow-capped Iztaccíhuatl volcano lies just above the center of the image. The city of Texmelucan can be seen at the upper right. 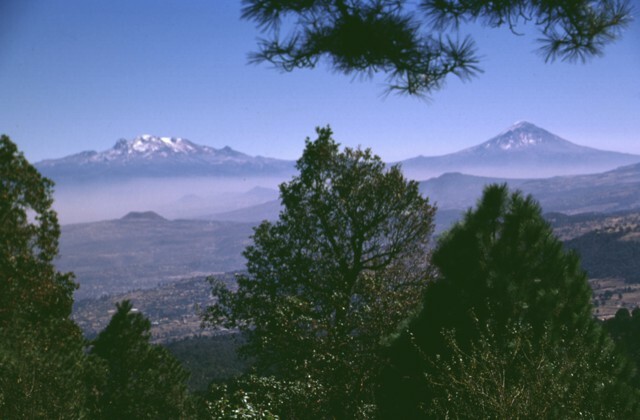 Across the Paso de Cortés from Iztaccíhuatl is steaming Popocatépetl volcano, located SE of the city of Amecameca (mid-left margin). 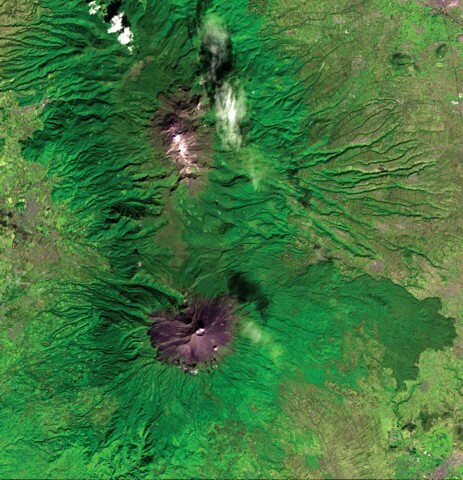 A voluminous prehistorical lava field from Popocatépetl forms the forested lobe extending about 20 km down the eastern flank at the lower right. 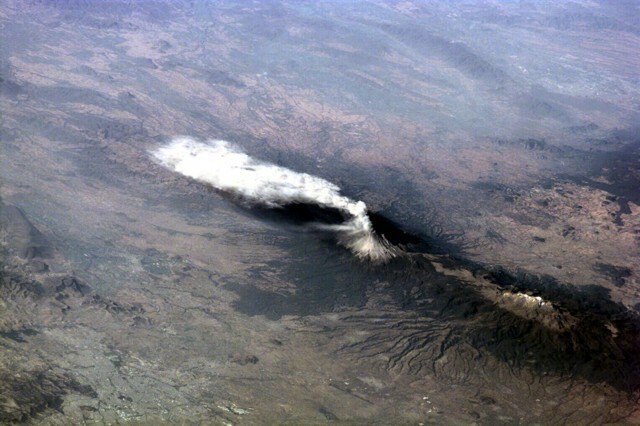 An ash plume from Popocatépetl volcano on January 23, 2001 is blown to the south. The plume reached more than 9 km above sea level. Larger explosions the day before had produced plumes that rose 8 km above the 5426-m-high summit and pyroclastic flows that swept 4-6 km down the north flank. The large dark-colored area below and to the left of the volcano is a voluminous prehistorical lava field. Elongated Iztaccíhuatl volcano, its summit capped by snow, is visible at the lower right. 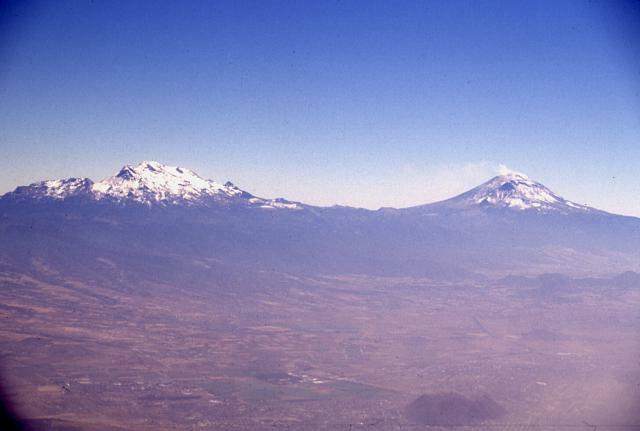 Snow-capped Iztaccíhuatl (left) and Popocatepetl (right) are seen from the SW on a rare smog-free day. The two 5000-m volcanoes are the 2nd and 3rd highest in México. Multiple vents forming Iztaccíhuatl give the volcano the profile of a sleeping woman from this perspective. Fresh snowfall coats Popocatepetl, whose slopes had been discolored by periodic ashfall from eruptions beginning in 1994. This dramatic photo looking south from Telapón volcano shows the rounded Papayo lava dome in the foreground, with snow-capped Iztaccíhuatl (left) and Popocatépetl (right) in the background. These volcanoes, along with Telapón, and Tláloc stratovolcanoes, form a prominent N-S-trending chain east of Mexico City transverse to the trend of the Mexican Volcanic Belt. Photo by Anita Cadoux, 2007 (Instituto de Geofísica, UNAM, Mexico). Large Eruptions of Iztaccíhuatl Information about large Quaternary eruptions (VEI >= 4) is cataloged in the Large Magnitude Explosive Volcanic Eruptions (LaMEVE) database of the Volcano Global Risk Identification and Analysis Project (VOGRIPA).